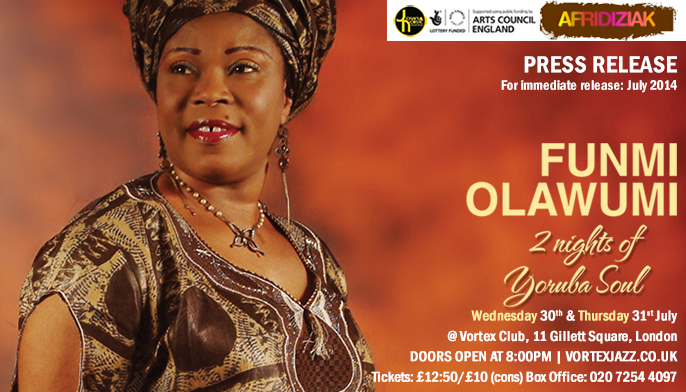 Nigerian singer Funmi Olawumi performs at the Vortex Jazz Club on 30th and 31st July 2014 for two nights of Yoruba Soul. Funmi Olawumi, the leader and founder of the Yoruba Women Choir, performs an intimate show with her 9-piece band as she premieres songs from her soon to be released CD ‘Yoruba Soul’ which takes off from the success of her current CD ‘Funmi Ti De’ (Joyful Noise Records). The new recording Yoruba Soul’ brings together all the glorious elements of Nigerian rhythms of afrobeat, hi-life, juju and fuji into one infectious Naija rhythm.